*The information and coupons have been provided by Nature’s Harvest® so that I could try the product and share my thoughts and information about Nature’s Harvest® bread. The opinions expressed in this post are my own and do not reflect the opinions of Nature’s Harvest® bread. Back to School is here in my house! We have had our first week of school with great success. Part of that success I believe is eating a healthy breakfast and a healthy lunch. Healthy food can fuel a learning mind to help kids stay focused. This is our first year packing school lunch since my son has just started kindergarten. 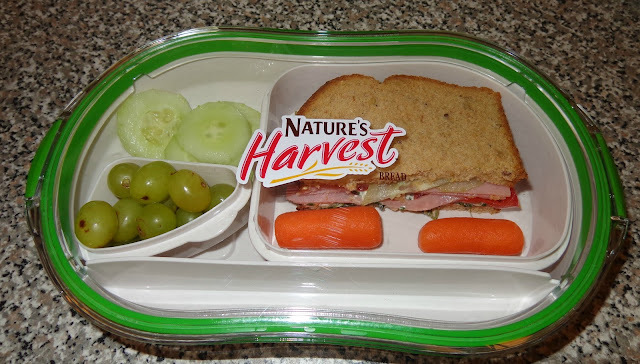 I was so excited at the thought of making fun an tasty sandwiches to put in his lunchbox. 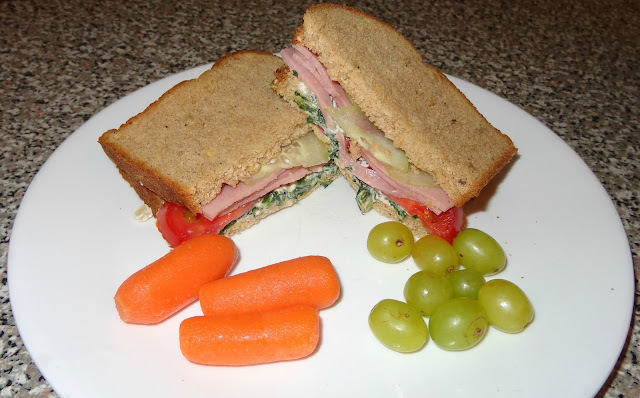 I wanted to make a sandwich that had many flavors in it to give it a meal between to delicious pieces of bread taste. 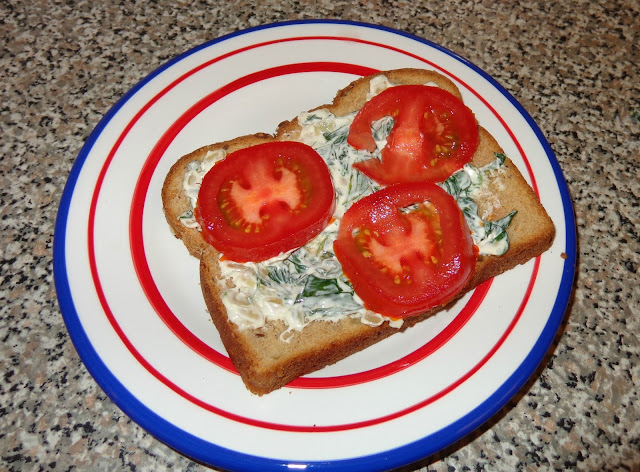 I started with one of my sons favorite dips I make, spinach dip with cream cheese. My spinach dip has garlic and onions in it, I find it to be a tasty way to get my son to eat them without him realizing it. Next I added sliced tomatoes, ham and thinly sliced cucumbers. 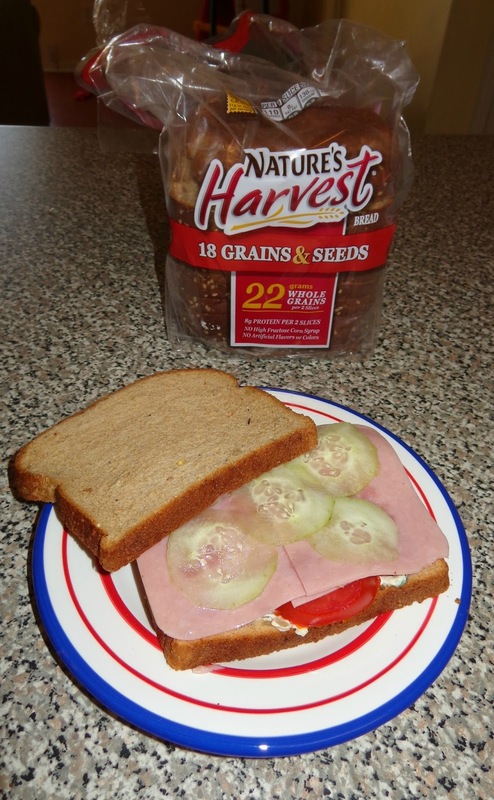 I am using Nature’s Harvest®18 Grains & Seeds whole grain bread in my sandwich. My son likes the seeds on the sides of the bread, I like that it has 8 grams of whole grains per slice. To celebrate Back to School season Nature’s Harvest® is hosting a Nature’s Harvest® Sandwich Art Photo Contest from August 24th to September 6th parents can visit the Nature’s Harvest® Facebook Page to submit a photo of their sandwich art creations, using Nature’s Harvest® bread, for the chance to win fun prizes! One grand prize winner will receive a “kitchen crash” from Celebrity Chef Kelsey Nixon, where she’ll cook sandwich-centric meals and provide tips to the winner’s family! Each variety of Nature’s Harvest® Bread is baked with at least 8 grams of whole grains per serving which will put them well on their way to consuming 32-40 grams per day which is recommended by U.S. Dietary Guidelines. My son added his own creation of a sandwich with the ingredients I was using. He said it was his turn to be a sandwich creator! 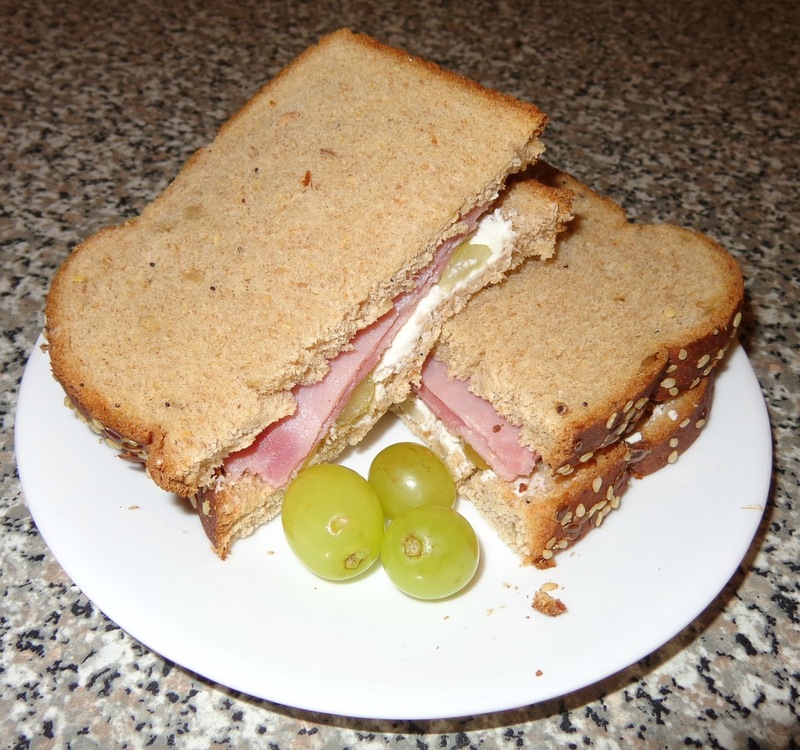 He made a sandwich using Nature’s Harvest® bread covered in cream cheese with ham and sliced grapes in it. It was actually very tasty! So proud of my little chef. This contest is a fun way to get your kids involved with the idea of healthy eating by letting them help you create sandwich art for their school lunch. What are your ideas for a creative and tasty sandwich?